Where’s Santa Claus? When will Father Christmas arrive? Millions of children around the world are asking these and similar questions on Christmas Eve. To help, two there are two great services that stand ready: NORAD Tracks Santa and Google Santa Tracker. As usual, Search Engine Land stands ready with its own tradition, to guide you to get the best from the services. Below, discover how to track Santa whether you’re using the web, a smartphone, watching TV or even if you want to make a voice telephone call. NORAD is the acronym for the North American Aerospace Defense Command, a joint US-Canadian military operation. NORAD has been tracking Jolly Old St. Nick for 61 years now. It began in 1955, due to a mistake. 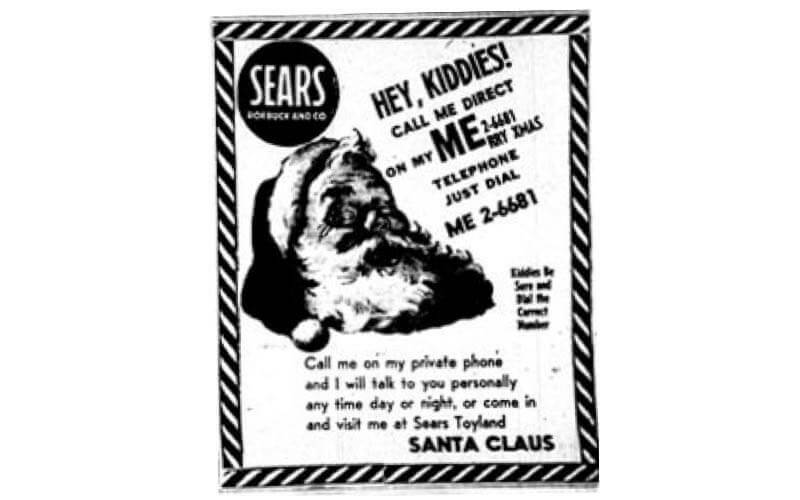 A Sears store printed the wrong telephone number to call Santa in the ad shown above. That number rang the headquarters of NORAD’s predecessor, CONAD. The military group responded by giving updates on Santa’s whereabouts, a tradition that’s been going on ever since. Google got involved with tracking Santa in 2004. First, it began on its own within Google Earth. 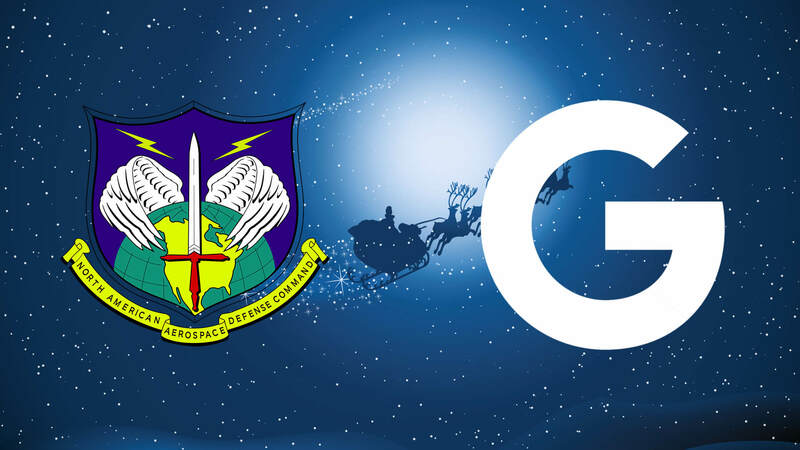 From 2007 through 2011, NORAD and Google worked together to spot Father Christmas. In 2012, Google went back out on its own, and Microsoft became NORAD’s partner. You can read more about Google’s Santa-tracking history in our article from last year: How Google Became A Santa Tracker Tradition To Rival NORAD. Click on the link in the box, and you’ll be taken to Google’s Santa Tracker, where Santa’s location can be found. More details about that are below. Last year, you could search for “Where’s Santa” on Microsoft’s Bing search engine and get his current location. That doesn’t work this year. 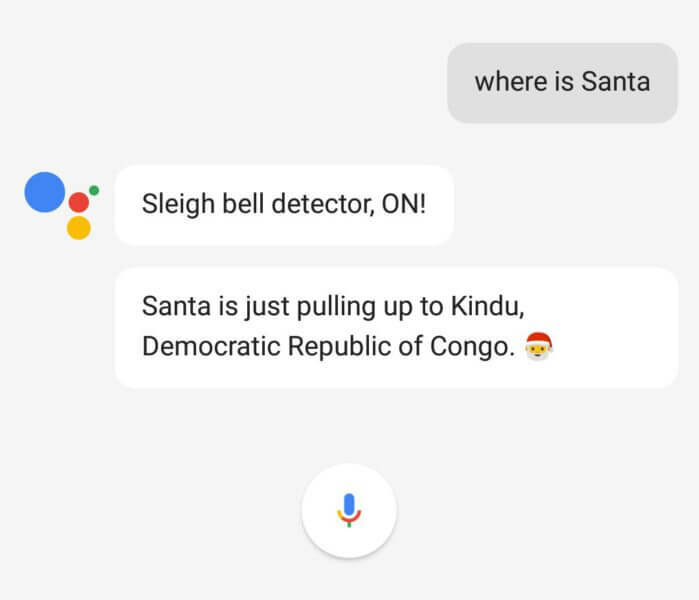 This also works for those with Google Home if you ask “Where’s Santa,” as demonstrated further below. However, I can’t get that to work on my iPhone, Windows Phone or Windows desktop. On the phones, Cortana suggests visiting NORAD. On desktop, it gave me videos. As for Apple Siri, it just jokes about Santa being either at the North Pole or at his beach house. Another fast way to track Santa is to directly visit NORAD Tracks Santa or Google Santa Tracker on the web. At the top of the screen, you’ll see where he was last spotted, where he’s going and an estimated number of gifts delivered. You can use your mouse to click and drag to rotate the scene. Buttons in the top right allow you to zoom in and out. 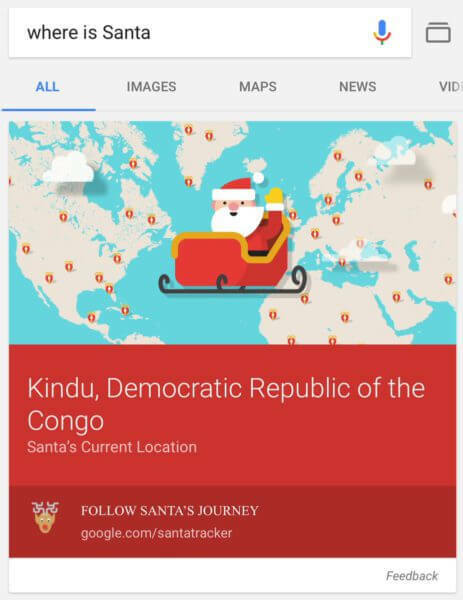 Google’s map displays where Santa is currently and maps his previous locations. If you scroll down, below the map you’ll find more about his distance from you, gifts delivered and Santa’s next stops. 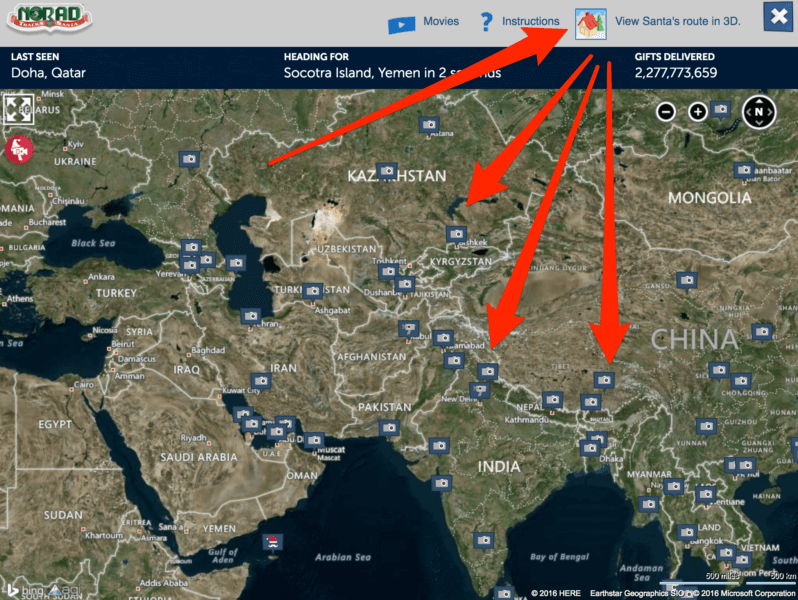 Why do trackers show Santa in different places? Some kids might be confused if they check both trackers find that Kris Kringle seems to be in different locations at the same time. How is this possible? One reason is because NORAD depends more on radar and satellites to watch for Santa, while Google depends more on updates from wifi hot spots and cell phone towers. That can lead to some delays and differences. For more about this, see our more detailed story from 2013: Santa Tracking Explained: Why NORAD & Google Show Different Locations & Gifts Delivered. The bigger reason is that Santa Claus is lightning fast. By the time he’s located in one spot, in a blink of an eye, he’s moved on to the next. That’s why when it’s bedtime, children really should get right to sleep. Santa could appear at any moment! 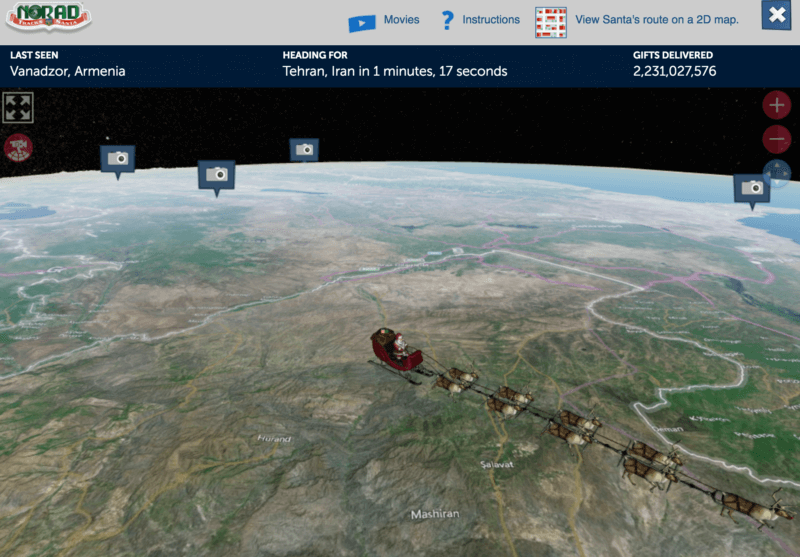 The maps at Google and NORAD allow you to see all the places that Santa has already visited. Not all locations are shown. Santa visits everywhere. Showing every locaton would make the map too crowded! If you don’t see your own place, don’t panic. Santa has either already visited or will be soon. At NORAD, to find where Santa Claus has been, use the 2D/3D button at the top right to reveal a 2D view of the world. The icons on the map show where Santa was previously spotted. Click on a camera icon, and search results from Wikipedia about the place will appear (last year, these were results from Bing). As explained earlier, Google’s map will show all the places Santa’s been by default. Last year, you could click on any previous location to learn more about it. That no longer works, this year. To see all the Santa Cam videos currently posted, click on the “Movies” link at the top of the NORAD site. That will open up a window with a video playlist. NORAD also has a YouTube channel. Unfortunately, it doesn’t list its Santa Cam videos there, even though they are hosted on YouTube. Instead, you can only discover the latest ones through the NORAD site. Google has video clips, but they don’t show Santa in flight, nor are they specific to any location. All the apps do is take you to the NORAD site on the web, however. So, you can just go there in your mobile web browser and have the same experience, app-free. 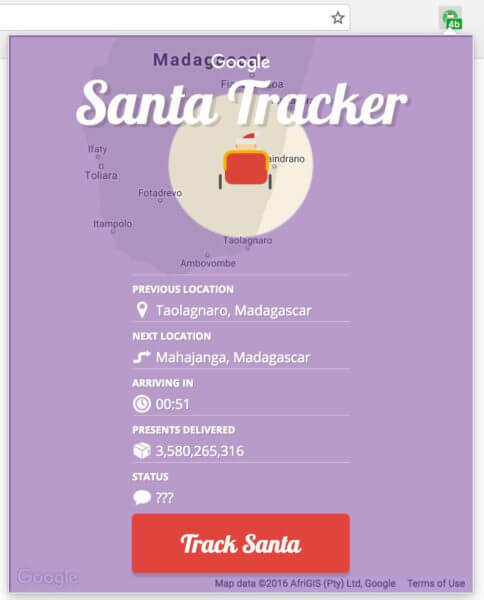 Google only offers an app for its Santa tracker on Android, which provides basic tracking information. 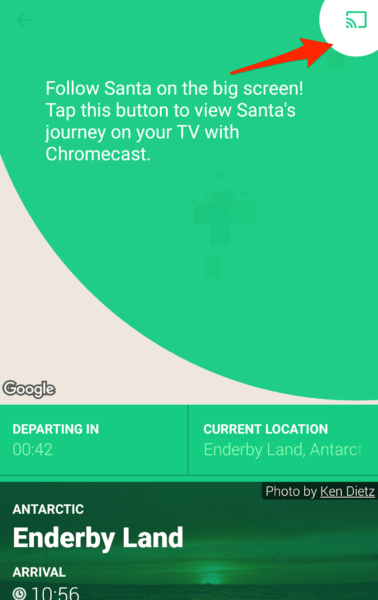 Google’s app also offers the ability to cast Santa’s location to a Chromecast-enabled device, which is nice. More on this is explained below. I had a little trouble getting it going on my TV this year. I had to restart the app a couple of times. It’s nice when it appears, though I miss the format last year that showed both current location and the time until Santa arrives in your location. Yes, Santa tracking can be done through social media. NORAD provides updates on Santa’s location through Twitter and Facebook (its Google+ account isn’t active this year). Two years ago, Google provided updates via social media through its Google Maps accounts. Last year, it stopped. It hasn’t retuned this year with them, either. Want an email update on Santa’s location? Just message to noradtrackssanta@outlook.com. You should get a response telling you his current location. You can also make a voice telephone call to NORAD, just like how the whole Santa tracking thing started. Be sure to wish the volunteer a Merry Christmas! And Merry Christmas and Happy Holidays from all of us here at Search Engine Land! Note: This story was updated throughout the day to add some examples of Santa tracking in action. 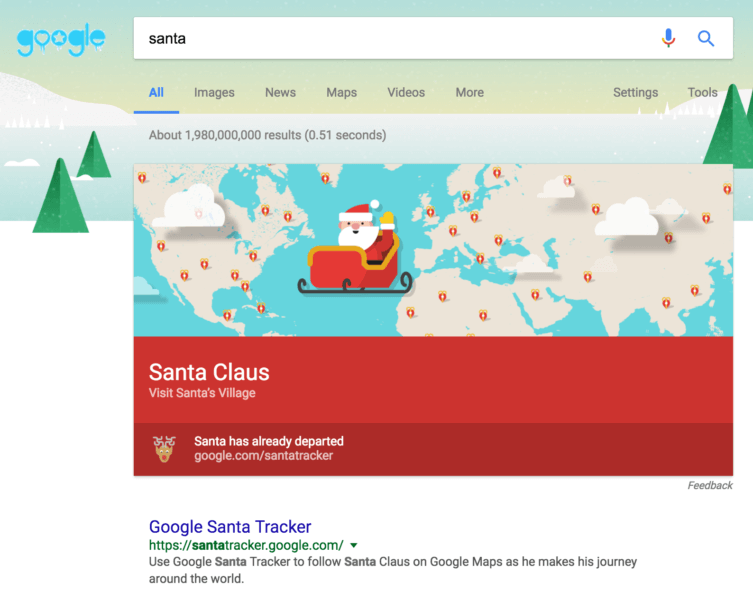 Tags:A-Post to Marketing LandA-Post to MarTech TodayChannel: ConsumerYour Guide To Santa TrackersYour Guide To The Google Santa Tracker.